Get them both at Bijou salon in Skaneateles! Hair tinsel is that little sparkle you see in women's hair, it's incredible how many people have been asking, I've seen it on the red carpet, we actually add sparkle (glitter and hairspray) to our littlest guests almost all the time when they come visit us, this is just like it, only lasts slightly longer and any age can wear it! Oprah mentioned the new product on her show in January. 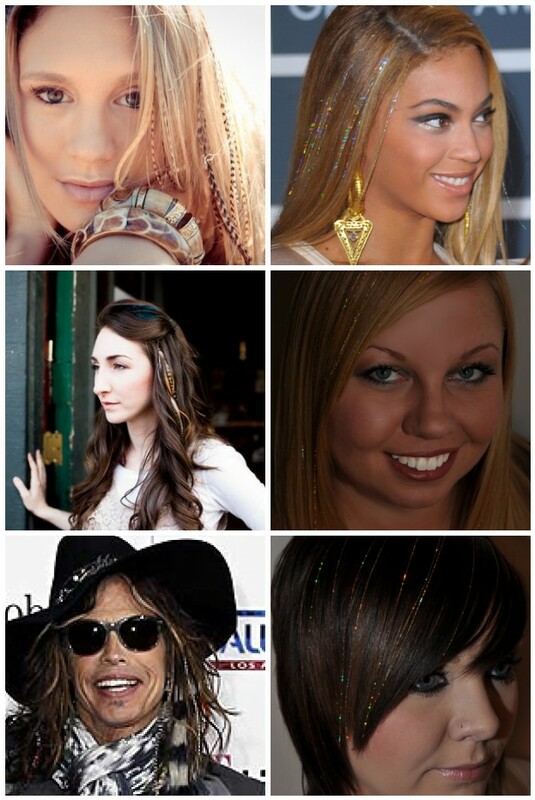 The new hair bling goes by names such as; hair flairs, hair shimmers, bling strands, hair glitz, and hair tinsel which is the standard name they seem to go by. The tinsel has also showed up on the red carpet like Beyonce and also in Adrienne Maloof's Hair from Real Housewives of Beverly Hills. It's fun and hot and most important, super inexpensive, $2 per strand! Now, the feather extensions, I saw these first on Steven Tyler on American Idol, I immediately thought, oh I remember getting those in the 80's at carnival's, I loved them, they were on roach clips...WELL, guess what, they have been improved, you can purchase them on little clips so you can wear them when you want, or you can be really daring and get feather extensions that Bijou will apply directly in your hair! Among the celebs sporting feathers are Reese Witherspoon, Blake Lively, Selena Gomez, Fergie, Cameron Diaz, Lea Michelle, Hilary Duff, Taylor Swift, Christina Aguilera and as I mentioned, Steven Tyler! No longer the chunky clip-in style, these are thin and styled along with the wearer's hair! They look totally natural....in an "uber-fashion-way"! Designers like Betsey Johnson, Juicy Couture and Alexander McQueen are just a few of the A-List designers hopping on the FEATHER EXTENSIONS trend! The best thing about these feathers is they can be WASHED, BLOW-DRIED, STYLED and even CURLED just like your hair. Durable and low-maintenance, they are easily installed, removed and reset in 5 minutes! Installation and removal causes no damage to hair, and they last up to 3 months! Bijou will have the clip in feathers on sale for $25 starting Tuesday April 26th and the tinsel and feather extensions will be available next week!